Aravinda de Silva, Sri Lanka's chairman of selectors, said poor form was the reason for Sanath Jayasuriya's exclusion from the team for the Asia Cup, while Ajantha Mendis was left out for "tactical reasons". "Sanath has not had a decent run lately we sidelined him after considering his performance over the past one year," de Silva said. "The decision to leave Mendis out was for tactical reasons. There are certain decisions we took for tactical reasons. Those areas I wouldn't want the opposition or any other team to know. It was discussed among the captain and the team management. I will talk to the players individually and explain to them so that they know why we have taken such a decision." Jayasuriya's miserable form with the bat continued at the World Twenty20 where he averaged 3.75 from six matches, leading to speculation about his future in the side. Mendis played a crucial role in Sri Lanka's victory in the recently concluded tri-series in Zimbabwe, so his exclusion for the Asia Cup was met with surprise. The selectors also gave unexpected call-ups to allrounder Farveez Maharoof and left-arm spinner Rangana Herath. "When we talk of allrounders there are two types: a bowling allrounder and a batting allrounder. Angelo Mathews is a batting allrounder and we wanted a bowling allrounder so we picked Maharoof," de Silva said. "We took Maharoof's record in Dambulla and he had performed well in the conditions there. When he was injured he couldn't play many matches and some of the matches he played were while he was recovering which we have also considered. Now that he is 100% fit we will look at his performance from now on," he said. Herath, De Silva stated was added to the bowling to lend it some variety. "We wanted some variation in the bowling attack. Since we are playing seven games at Dambulla the pitch might take turn towards the end of the tournament so we should have some sort of variation within the squad in case we need to have a bowler who bowls left-arm spin. Also Pakistan has got a fair bit of right-handers. We needed a bowler who will be able to bowl during the Powerplays. That's the reason why we have gone for him with his experience." De Silva said that the Sri Lankan batting line-up looked solid with a line up consisting of Tillakaratne Dilshan, Upul Tharanga, Kumar Sangakkara, Mahela Jayawardene, Angelo Mathews, Chamara Kapugedera and Thilina Kandamby. 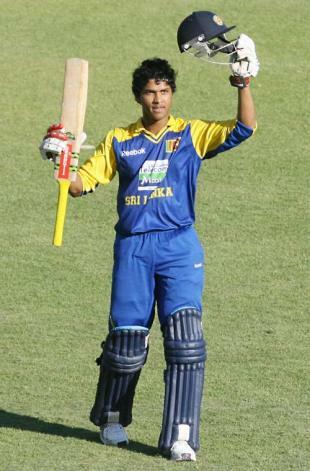 When media personnel raised the question why two youngsters - Dinesh Chandimal and Jeevan Mendis - who performed well in Zimbabwe were not included, de Silva said, "Chandimal and Jeevan have got great potential. It was very heartening to see them perform the way they did. We are playing three games initially in the Asia Cup and when you look at the team for the first two games they might not get the opportunity to play. "If that happens we are depriving them of the opportunity to go and get some exposure in Australia. We thought the best idea would be to allow them to go to Australia with the Sri Lanka A team and play there. That's one tour I will follow very closely which I think will be competitive. It will really separate the men from the boys, a tour of Australia," de Silva said.